Here are the first graders. They are still working on their special project: a prequel to one of the books we read in class. This project was supposed to have finished ages ago, but it has begun to merge into a project about how to use powerpoint. Here in this picture, the second graders are attempting to draw a mongoose. We just finished reading Rikki-Tikki-Tavi by Rudyard Kipling, and I wanted to know if they'd done a little research to see what a mongoose was (or alternately, if they had been listening in class). Here, the second graders are having a class discussion about "When I Heard the Learned Astronomer" by Walt Whitman. Our discussion topic was: does studying something in detail increase or decrease our appreciation of the aesthetic value of art, literature, music, etc. Here, our third grade class is having a debate based on "The Flying Machine" by Ray Bradbury. We debated many topics, such as the arms race, national security, totalitarianism, and specifically whether or not the emperor in Bradbury's story was right or wrong to order the execution of a man who had created a flying machine that the emperor was afraid might fall into the hands of his enemies. Here the third grade is preparing for their final project. They will make a public service announcement, from 30 to 90 seconds long, on a topic of their choice. Right now they are discussing what their topics will be. We have three groups, each making a different PSA. One group enjoys saying "Let's do drugs." Here the third graders are having a class discussion about "I Have Been One Acquainted with the Night" by Robert Frost. Here the third graders are going over some discussion questions in reading class. Here the high school first graders are reading a book before class ... a highly suspicious book they found in the library. Well, at least they're reading in English, right? 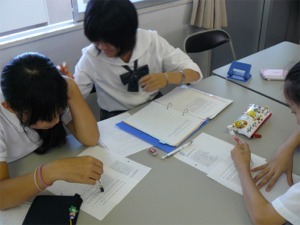 Here the high school first grade students are listening to a lecture by a guest speaker from Chugoku Junior College. We're reading a short poem called "An Easy Decision" by Kenneth Patchen, and we're going to talk about interesting people and what makes people interesting. We're also talking about the content of poems, specifically the choice of animals in the poem "An Easy Decision." We're reading "When I heard the Learn'd Astronomer" by Walt Whitman, and we're going to have a class discussion about whether it's better to enjoy art, music and literature only with our senses, or whether it's better to learn it in a more scientific way. We're also talking about work usage in poetry. We're reading "Acquainted with the Night" by Robert Frost and we're talking about walking at night. We're also talking about tone in poetry. We're going to be talking about mustaches. We're also possibly going to have a preview of some materials I'm preparing for the new high school curriculum. We're going to talk about the course and what to expect, and changes in the course (since this Wednesday will be my first chance to see them this term). We're going to try to finish the last things given to us by the Yumeji Art Museum project, and then talk about test-taking skills. Here are the latest photos of my classes. Here a couple of my high school first graders are waiting for our 8th period class to begin and are filling the time drawing on my board ... this time drawing slightly troubling pictures of ME with my head on a platter!!! Here's my junior high school first grade class. Here they are working on a powerpoint presentation for our special projects class. Here's my third grade class. Here's my high school first grade class. And here's one of my high school first graders have a quiet moment with our much-abused class mascot.